Warner Brothers are on the lookout another Bruce Wayne. But don’t worry, Ben Affleck will still dominate the role in the upcoming film, Batman v Superman: Dawn of Justice. Casting calls are scouting two boys ages 10 and 12, one to portray a younger version of Ben Affleck. "Midthunder Casting is conducting a talent search for a Warner Brothers feature film which will heavily feature two young boys in SAG principal roles; one Caucasian 12 year old boy (to portray a young Ben Affleck) and one Caucasian 10 year old boy. Both Boys must have extensive WUSHU, KUNG FU, or PENCAK SILAT training and experience; however, they will consider high level (state - world champion) competitors in all martial art forms." That’s a curious description. Why does the film need such a high skill set for a young Bruce Wayne? Also, a month back we saw a fan take an instagram video of what looked to be the filming of the Thomas and Martha Wayne murder. In the video there already is a young Bruce Wayne, so the question remains, why do they need this other one? And especially one with martial arts training. Will there be a fighting scene between these two kids? Something to give us a back story of Bruce Wayne’s own fighting skills. Bruce Wayne was a young kid when he watched his parents die, and soon after started to travel the world, often dropping out of universities, and learning more "practical" skills. So maybe this young, athletic Bruce Wayne will show us a glimpse of that time. This isn’t the first time we met a young Bruce Wayne in a Batman film. In Christopher Nolan’s Batman Begins we are exposed to a lot of the inner turmoil that the young Bruce went through after losing his parents. Not only that, but we also saw when he first came in contact with one of the things he would come to fear the most, and therefore take his name from, bats. 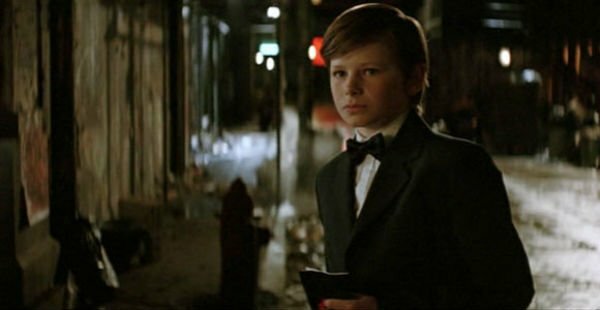 The Bruce Wayne in Batman Begins was very young, 8 years old, and was portrayed by actor Gus Lewis. It is at age 8 that his parents die, so if this casting is calling for a 12-year-old then we are sure to get a few different age gaps of Bruce Wayne throughout the film. And if there is a different actor for each age, that would be three Bruce Waynes in one movie. That’s a lot of brooding for one film. Well, we’ll find out when Batman v Superman: Dawn of Justice hits theaters March 25, 2016.